We’ve been fans of Rudi’s gluten-free bread for years. Their tortillas and wraps are great, especially the spinach tortillas. (Those are Lu’s favorite quesadillas.) Their frozen pizza crusts are good for a last-minute dinner on a weeknight. But it’s their breads that really impress us. Their multigrain bread is wholesome. Their cinnamon raisin bread with peanut butter and honey is one of my favorite Saturday morning breakfasts. And Rudi’s gluten-free white bread has been reworked to be softer and fluffier. It makes a great grilled cheese sandwich. We’re happy to announce that Rudi’s Gluten-Free has become our latest sponsor. We like to let our sponsors speak for themselves. This gives you an idea of why we have chosen to work with Rudi’s Bakery. Why did Rudi’s start making gluten-free bread? “What is now Rudis Organic Bakery began in 1976 as Rudis Bakery, a small local bakery in Boulder, Colo. Rudis Bakery soon gained a reputation for nutritious, flavorful, preservative-free breads, rolls and buns. Why does Rudi’s continue making new gluten-free products for people? Can you share a story of a customer letting you know how your breads have made his or her life better? “Our customer service department gets calls and emails every week from consumers who have been gluten-free for years and had given up on being able to eat bread or tortillas that tasted good, until they tried Rudis Gluten-Free products. Were always touched by how thankful our customers are for gluten-free products that taste and feel like the real thing. What’s on the horizon for Rudi’s? “Were seeing growth and increased demand for both our Organic and Gluten-Free products, which is exciting for the company. In fact, we just completed a bakery remodel in April 2013. The new remodel allows for increased production of both Rudis Organic and Rudis Gluten-Free products to better meet growing retailer demands for Rudis Bakery products. The bakery remodel added more than 10,000 square feet of space, which is expected to nearly double the weekly output of both the organic and gluten-free production lines. We appreciate that Rudi’s Bakery takes such great care in making good gluten-free breads. We think you will too. Rudi’s is giving away product coupons  much easier to find the bread yourself than have it shipped  to 3 lucky readers. Leave a comment about why you’d like to try Rudi’s breads and make sure your email address is easy to find! This giveaway is open to only U.S. residents. Winners will be chosen at random by Wednesday, May 15th. Update: winners have been chosen and Rudi’s has been notified. Three of you should be hearing from them soon! My partner recently went gluten free and it would be great to have a good loaf of bread she can eat with some of our favorite quick lunches like tuna melts and meatloaf sandwiches. Thanks! Thanks for the thorough review on Rudi’s bread. I agree with Alison; it is good to get recommendations on which gluten-free products actually taste good and have nice texture. I don’t want to think about the amount of money I have spent on items I have purchased, taken home, tasted, and then trashed because they were inedible. Gluten-free-product producing is not for the taste-bud challenged. I love Rudis and recommend it all the time. No other gf breads compare. Just tried their wraps and those too are great. Yay. I’m already and Rudi’s fan and LOVE IT!!! Thanks, Rudi’s! I love to make turkey sandwiches with Rudi’s bread for lunch! My husband (who can consume gluten) prefers, and LOVES, their cinnamon raisin bread. Rudi’s makes picnic lunches and sandwiches for hikes super easy! Haven’t been crazy about the gluten-free breads I’ve tried. Look forward to trying Rudi’s. Would love to try a gluten-free bread – I am dealing with major morning sickness and finding it VERY challenging to eat, my unpregnant diet was so easily gluten free. Now I would just about die for a piece of GOOD TOAST!!!! I would love to try Rudi’s. We are in process of making the switch to gluten free…..so far not thrilled with our bread options. Maybe Rudi’s is the answer! Just got your latest cookbook yesterday, can’t wait to dig in to Gluten Free Everyday! Thanks for being a great resource to great food. Just this week I found out I’m sensitive to gluten. I am sort of dazed and confused over here…I’ve made my own whole wheat bread and pasta for ages and all of a sudden I can’t eat it! I’d love to try Rudi’s…the loaf I got from the grocery store yesterday was less than inspiring. I’m sure hoping there are better options out there! I love their gluten free tortillas! I’d love to try your new sandwich bread since I’m a huge fan of your products. The GF pizza crusts are great — I always have them on hand. I have enjoyed Rudi’s bread, although I’ve never seen their tortillas. Hopefully, I’ll find some of them soon. I’ve tried other brands that are decent, but I’d love to try something new! I’m always on the look out or good gluten-free products. Having just moved to the US I’m still trying to find out what brands to buy and where to buy them, so I’d love to try Rudi’s bread. I’ve been eating gluten free for almost 2 years and would love to try Rudi’s bread. I strive to keep my diet pretty wholesome and clean and appreciate that they do not add preservatives to their bread. My daughter was just diagnosed with a gluten sensitivity last week. It’s been a hard, expensive transition. Luckily we have a GREAT local store that carries every kind of gluten free food imaginable including Rudi’s. I’m gluten free, have been for nearly 20 years. I’ve tried my share of gf products, some are good while others… uh, simply are not. If Rudi’s is delicious, is love to try! Thanks for doing this giveaway! I am recently diagnosed and haven’t found much in the way of good bread, and haven’t found ANY kind of tortilla made in a dedicated, certified GF facility. Plus, Boulder is fab! I have never had a good grilled cheese on gluten free bread. The cheese always seems to melt into the bread and it can’t be tasted. So if the new Rudi’s GF white bread is good, I am willing to try. I prefer Rudi’s GF Multigrain, but usually toast it for a snack. I never was crazy about sandwiches, but bread as an accompaniment is good. I only like corn tortillas, so don’t have a problem with finding them. the recommendation by the grandmother and grandson is awesome. i’m always on the look out for high quality bread. I would love to try their cinnamon raisin bread and tortillas! They sounds heavenly. I’m always on the lookout for good, wholesome gf products. Love the Rudi’s Fiesta tortillas. I make a daily “sandwich” at lunch with them. Don’t feel deprived at all! I’d love to try more of their products. These days I always have a loaf of their bread in my freezer, but would love to try the rest. Thanks for the giveway. Like! We are Rudi’s fans. I work full time and have a 7 month old, baking bread is now really hard and we love Rudi’s. I recently found out I need to remove gluten from my diet. I am loving your blog and would love to try Rudi’s – I have a serious toast craving!! I haven’t tried Rudi’s bread yet because I have a sensitivity to eggs, but I’ve heard that sometimes egg whites don’t create a response. The frozen gluten free bread is good for toast, but I’ve really been missing sandwiches! I may have to try it out. Love your website and your books! The only Rudi’s products we have in my little neck of the woods are the breads, but that is OK by me because they are fantastic. I love that they are soy free also, because on top of gluten-free, we are also a soy-free household. Thank you Rudi’s for making bread that we can safely eat. Because of the very high altitude I am at, I have been struggling with baking gluten free bread. I have mostly given up for the time being, as the consistent flops are such a waste of resources (though I plan to try again after I get a little more experience with gluten-free flours). In the meantime, as summer approaches and we start to do more traveling and camping, being able to bring a sandwich as a lunch as an alternative to all the many salads I have grown accustomed to would be nice. I would love to try Rudi’s, and the coupon would be so helpful. The only GF bread I have been able to find locally is the challah bread and it is wonderful….make french toast, bread pudding as well as sandwiches. I’d love to be able to taste the rest of the GF line and have it in supermarkets closer to me. There is GF Challah bread? I have been dying to find it? Where can I get it? Wait a minute. Aren’t you sensitive to all the gums? Rudi’s is full of xanthan gum. So you’re sponsored by a product that you don’t eat? That seems weird. Maggie, I can’t eat xanthan gum often. I have it occasionally, like when we’re on book tour and people offer me their treats! But if I have it two or three days in a row, ay. Thus, that’s why it’s a Saturday morning treat, instead of every day. Also, we realize that many people might not have this problem with the gums. We like to recommend products that are food, even if I can’t eat them every day. This is about more than me. I am recently gluten-free and am excited to try Rudi’s bread! My mom bought Rudi’s this past Christmas thinking it was the same as Udi’s, that I had requested. I was surprised it was so great! I like the Rudy’s fiesta torillas and bread, but I really appreciate the Gluten Free Pizza Crust. After 15 plus years, I’m settled into not eating gluten and the life style that comes with it. But the one time I used to feel kind of “left out” was when my family had pizza. Once I found the Rudy’s Gluten Free Pizza Crust that changed: I add sauce, cheese and toppings to Rudy’s Pizza Crust and everyone is now envious of me! I’d love to try Rudi’s breads….especially the wholegrain ones. It’s so hard to find a good truely whole grain gluten-free bread. I have tried and love the multigrain bread. I would love to try the tortillas though, as I rarely get to make myself wraps for lunch. I have just started living life without gluten, and I feel worlds better- it is truly amazing and I’m so grateful I figured out that gluten was hurting me. I also love food, and I have been missing the texture and taste of bread, especially the simplest thing of all: toast. Toast with butter, some coffee, and the NY Times used to be a Sunday ritual… could it be again? It sounds like Rudi’s has an incredible selection of goods to try out- how exciting is that? I’m always looking for a great bread and haven’t tried Rudi’s yet. I’ll definitely try the spinach tortillas! They sound yummy! I’m always looking for new gluten free products to try but one of the main items that I always want to try is GLUTEN FREE BREAD- why-Just because you are gluten free doesn’t mean you want to sacrafice some of the luxuries of eating. I would really love to give this bread a try and pass on the brand to others who need a good bread to eat. Thanks! I love the Rudi’s tortillas, but would like to try the pizza crusts. Does anyone know any good GF bread that is vegan? I went right out yesterday and bought a loaf of Rudy’s bread. That shows the power of GFG! Would love to get my hands on the tortillas, haven’t seen them yet! I also would like to try the reworked white bread as it was a little dense the last time I tried it! I have not yet tried Rudi’s, honestly, because I have spent a lot of money on bad gluten free products. I am more confident about trying this bread after reading the review and I will be looking for Rudi’s on my next trip to the store. Thanks for sharing Shauna! 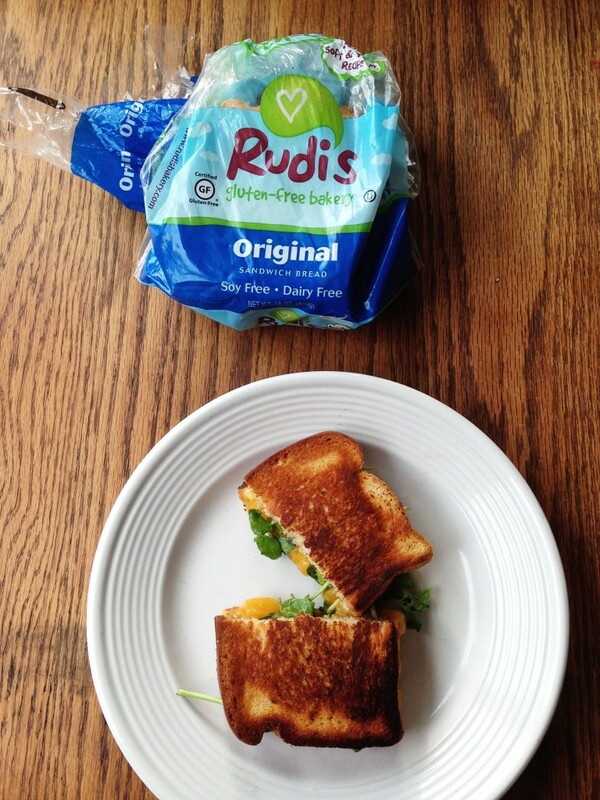 I’ve been using Schar Gfree bread but would love to try Rudi’s! Thankyou for the Rudi’s review, can’t wait to try it out! Went gluten free for health reasons relatively recently… and just the other day was thinking about how much I’m going to miss being able to quickly pack a sandwich for a lunch on the go! I have been gluten free for several years after trial by fire trying to figure out why I was having so many issues. I have tried several GF breads and products and frankly they aren’t that good especially the breads. I have never tried yours and I don’t know why. So now….let me try it. I would like to find a good bread. I miss it!!! I was diagnosed 3 months ago with a wheat allergy and suspected celiac (can’t tell because I went wheat-free immediately and therefore the test showed nothing :P) I used to live on sandwiches and pasta…now I would do just about anything for a decent BLT! GF products are so expensive that I hesitate to buy them without knowing I will like them. The 2 brands I have tried were terrible and I struggled to finish them. I am now trying to mix up my own, so far with poor results. I’d love to try Rudi’s. Shauna, THANK YOU! Yours was the first book I stumbled across when the doc told me no more wheat. I’ve since read and thoroughly enjoyed/appreciated many of your candid and often hilarious tales. You have definitely helped me through a tough time, even now as I prepare sandwiches for my children for lunch..and drool just a little. I’m new to GF eating and have tried a handful of GF breads from the store. Rudi’s is most definitely my fave thus far. Thanks for shedding a little insight into the company. I love Rudi’s GF torilla’s. I warm them on the stove top and use hummus, spinach, roasted turkey, pepperichini’s, tomatoes, roll em up and make a delicious wrap! I was diagnosed 4 yrs ago this month with Celiac Disease and searched far and wide for GF bread I didn’t have to make myself that tastes good and is nutrtitious as well. Rudi’s, you’re IT! Thank you. I am a college student living in Chicago and I have Celiac Disease. I have stopped buying gluten-free bread becuase the texture is just never quite right. I would love to try Rudi’s! As a recent gluten free convert, I’m constantly on the look out for recipes/products/etc that can make the transition go more smoothly. Being able to try these products would be fantastic! My reason for wanting to try Rudi’s new products. His name is Benjy. He is 9 yrs old, and he is the reason I have re-learned how to make food. He is gluten-free and has the best attitude of any kid I have ever seen about the limitations of his food issues. He loves Rudi’s, but the best comment he has made about trying new gluten-free products is that he says it makes him feel special to know that people are out there trying to make food people like him can eat. When we walk by a GF product in a store or cafe, if he sees GF on the menu at a restaurant, or if I bake hims something special, he flashes me his grateful smile because he is thankful and seeing food he can eat makes him feel loved. I recently discovered that I am sensitive to wheat, although not gluten-intolerant. I tried one brand of GF bread from the store, and it was the nastiest stuff I’ve ever eaten. I’ve seen Rudi’s products in my local Publix, but hesitant to try another store-bought bread after my first and only experience. With your “seal of approval”, I will definitely be trying them. I’ve ordered flours to try and learn to bake GF (not that I’ve master non-GF baking), so it will be nice to have bread products to eat while I learn to bake my own. I LOVE LOVE LOVE Rudi’s multigrain bread, i use it for stuffed french toast and sandwiched too. I am excited to try Rudi’s new tortillas & wraps for lunch options. I LOVE LOVE LOVE Rudi’s multigrain bread, i use it for stuffed french toast and sandwiches too. I am excited to try Rudi’s new tortillas & wraps for lunch options. recently gluten free and I would love to try the tortillas!!! Those would be so yummy for wraps! I have never tried Rudi’s. I’ve heard about it but can’t find it around here. I’d love to give it a try & have my daughter, also g-f, try it. In fact, I’d love to write a review over at my website…www.becomingunglutened.com. When I realized that gluten was the cause of a host of issues for me, I was really bummed out. Now that I have an easy option with Rudi’s I don’t feel like the odd ball out. I hope that more restaurants will consider adding gluten free breads so that I can enjoy burgers again! Rudi’s is also the only bread out there on the gluten free market that is not hard as a rock. I have only tried the multigrain sandwich bread and the hamburger buns. REally looking forward to trying more! Thank you, Rudis! I’d still love to have a truly whole-grain option (it’s hard to go from 100% whole wheat to 2/3’s white starches), but at least I can eat a sandwich on occasion!